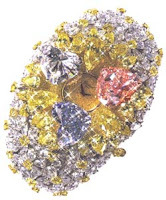 This watch, encrusted with diamonds, golden yellow, blue and red precious stones is something only millionaires can dream of telling the time by. It has a small delicate dial in the centre and is a stunning bracelet accessory at royal parties. Manufactured by Chopard, this beautiful piece of jewellery is priced at around 25 million US dollars. 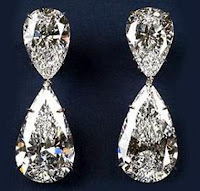 These diamond double pear shaped earrings would look exquisite with a white or silver formal dress. The sheer size and cut of the diamonds set into the platinum metal of the earrings ensures that the cost is a whopping 8.5 million dollars. Are you looking to buy your pet pooch something special? Then how about buying 'Man's Best Friend' a sparkling new diamond collar? This diamond collar studded with a range of stones - both round and pear shaped would look extremely delicate around the neck of your furry friend. 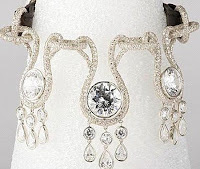 This specially designed collar costs around 1.8 million American dollars. A graceful clutch bag for those evening dinners at a quiet restaurant. This handbag comes with diamonds laid in a beautiful design along the opening and along the silver chain strap. The cost of this handbag is a good 1.9 million American Dollars. A cute cupcake shaped handbag for the young and adventurous millionaire daughters out there. 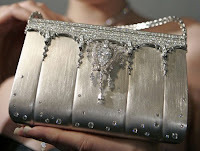 This purse is embellished with thousands of tiny diamonds and crystals to give it a fabulous look. Compared to the other high priced items mentioned here, it is priced at an affordable 4, 295 US Dollars. Misplaced your sunglasses again. Take a look at this cool pair of shades. Encrusted with tiny diamonds, these sunglasses with a gold rim and brown glasses are priced at a costly 383,609 US dollars. Now, these are certainly too dear to be lost. This lipstick manufactured by the House of Guerlain, Paris comes in a gold case studded with some of the most expensive diamonds. This Guerlain Kiss Kiss lipstick is a must have item for the clutch purse of a millionaire woman. It is priced at around 62,000 US Dollars. Get ready to be swept off your feet by a Prince Charming at your neigbourhood gala ball. For a millionaire woman, this is actually a strong possibility. Offering the wearer a Cinderella type of look, these diamond slippers designed by Stuart Weizman are priced at a cool 2 million US dollars. This perfume created by luxury designer Clive Christian is considered to be the most expensive perfume in the world. Created using the world's most rare natural ingriedients, it is priced at 215,000 US Dollars. Certainly, a fabulous gift to give the love of your life. Women like jewelery. No matters how much it costs. If they can afford they purchase the same.